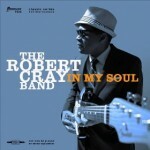 Share the post "Album Review: ROBERT CRAY – In My Soul"
He may be a 5 times Grammy Award Winner and the youngest living artist to be inducted into the ‘Blues Hall Of Fame’, but Robert Cray is always looking for a fresh and meaningful context for his enduring voice and effortless guitar playing. ‘In My Soul’ partially provides that context, albeit it reaches a notable high point by the mid-point, which he struggles to emulate thereafter. In case you hadn’t noticed soul has been back in favour for the last few years and Robert revels in the opportunity to bring his own brand of sophistication to the party. Robert Cray’s career has been played out along an enduring curve that has seen him shift from being the MTV backed, guitar wielding, great blues hope in the mid-80’s, to a master interpreter of song with undiminished guitar skills. Truth be told, he was cast in that role early in his career when he tackled songs by producer Dennis Walker and his label boss Bruce Bromberg. And while the focus was originally on his guitar playing, it’s his singing that makes ‘In My Soul’ a convincing contemporary take on an old genre. Robert’s signature vocal on ‘You Move Me’ tells you just what he is really all about. He’s got an arresting, instantly recognizable voice that is steeped in the kind of soul and r&b history and allows him to bring unexpected emotional conviction to a duet with Les Falconer on Otis Redding’s Nobody’s Fault But Mine’. It’s the irresistible combination of his soulful phrasing, subtle string bends and a conversational form of guitar playing that make Robert Cray special. His band understands the meaning of feel and soulful interplay. They record as a unit and explore exquisitely honed grooves with a velvet touch, to give the album a linear flow without losing any emotional charge. Intuitively produced by Steve Jordan, the album locks into several pulsating grooves which ebb and flow on the back of Robert’s expressive vocal, as he tackles the Isaac Hayes/David Porter soul ballad ‘Your Good Thing (Is About To End’) with a feel and intensity of a natural interpretative singer. It’s a beautiful arrangement with nuanced horns and intuitive band accompaniment. And while the album initially plays to his strengths, ‘Fine Yesterday’ is a signifier of the deep soul that permeates the core of this deeply wrought album. He evokes Al Green, but his soulful feel is predicated on his own secular interpretive and phrasing skills. He gives a tight arrangement the gentlest of nudges as his vocal gently caresses the track before eventually dropping down on the outro, as he adds the gentlest of vibrato laden notes to a mellifluous track. So far so good, but it’s at the mid-point that the album really kicks in, with the undulating funk of ‘I’ll Guess I’ll Never Know’. It’s a track shot through with Cray’s essential ability to give a mid-paced song a sense of urgency and sprinkle it with soulful stardust. The emphasis is wholly on emotional expression, before the tiniest pause ushers in a string bending guitar break. ‘Hold On’ is the jewel in the crown. Written by Richard Cousins and Hendrix Ackle, it builds from a repeated piano motif and Robert’s close to the mic breathy, whispered vocal. It’s a relationship song given its veracity and resolution by Cray’s subtle phrasing on a beautifully voiced track. There’s a classic line too, which neatly encapsulates his penchant for emotionally charged lyrics. ‘Never was a golden boy, the one who got the girl, when you finally made your choice, you really changed my world’. It doesn’t get much between than this. Truth be told, there’s a gentle descent thereafter, with the slow burning, delicate optimism of ‘What Would You Say’ and the ‘Green Unions’ pastiche of the ‘Hip Tight Onions’ instrumental pointing to a lack of material. ‘You’re Everything’ aims to redress the balance with a deep soulful groove on a triumph of the vocal over material. Robert digs deep to give the song a little more depth than its lyrics offer him, while Bobby Bland’s ‘Deep In My Soul’ almost suffocated under the weight of the heavy horn arrangement, as Robert battles to sing above the repeated horn line and belated guitar part. The middle of the song sounds like a potential outro as the track palpable drifts, while his extended solo is mixed too far back behind the droning horns. There’s still room for ‘Pillow’, a bonus track which Robert opts for a sitar tone. It’s a love song that is in danger of repeating the sentiments expressed in previous tracks. This entry was posted in ALBUM REVIEWS, ALBUM REVIEWS (Mobile), All Posts and tagged Al Green, blues, Bobby Bland, Bruce Bromberg, David Porter, Dennis Walker, guitar, Hendrix Ackle, In My Soul, Isaac Hayes, Les Falconer, Otis Redding, review, Richard Cousins, Robert Cray, soul, Steve Jordan, vocal. Bookmark the permalink.